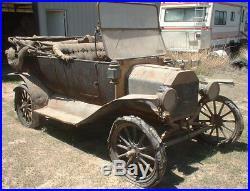 This very unusual and probably unique Model T Ford is definitely a true "survivor" and more specifically, a very rare "barn find". This car was supposedly stored away in a building and not used from 1933 onward. It still has an orange 1933 license plate on the back as you can see in the right rear view. I was told that this car had never been washed or cleaned up at all for about 80 years before I bought it so I decided to leave it exactly as I found it. I bought this car sight unseen from a friend several years ago. I try to do that every day because it usually has some information that interests me. The car was obviously dirty from that length of storage so the new owner decided to leave it dirty and on the trailer and call it his "barn find". I decided then that if that was the proper fate for his Corvette, then perhaps I should also leave this car just and I found it. I decided then to never make this car run and drive again or even clean it up at all. 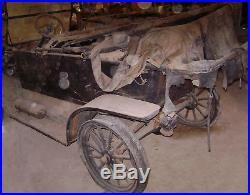 How many 104 year old "survivor" or "barn find" automobiles have you ever seen? The title for this car references the number 519,452 that is on the brass dash tag that came with this car. The previous owner probably removed the tag and took it to the DMV when they applied for the title that I received with this car. The engine serial number is 553,087 and according to Bruce McCalley's fantastic book titled "Model T Ford - The Car That Changed The World", that engine was assembled on August 6,1914. The first character in the engine block casting date is not readable so the casting date effectively becomes? 4 14 suggesting that that block may have been cast on August 4, 1914. If that is the case, the block was cast 2 days before the engine was finished and stamped with a serial number. The dash serial number tag for this car is numbered 33,635 numbers lower than the engine number. If anyone out there is an expert at correlating the engine and serial tag numbers for these early brass T's, please get in touch with me. 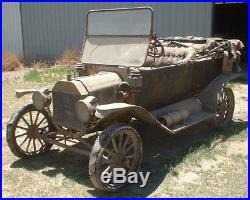 I have a very nice original and relatively low mile 1914 Model T Ford roadster in my collection that I may offer for sale here soon. It has the number 558,673 stamped on the brass tag on the right side of the dash board. That car has the number 592,584 stamped on the engine number pad. According to McCauley's book, that engine was finished and stamped on October 1, 1914. 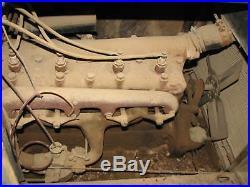 That engine block was cast on 9 28 14 which was only 3 days before it was finished and stamped with the serial number. The dash serial number tag is numbered 33,911 numbers lower than the engine number. It is very interesting to me that both of these assumed to be original T's have engine numbers 33,000 to 34,000 numbers higher than the numbers on the vehicle serial number tags. Please help explain this if you possibly can. Both of my 1914 T's have the steel crank handle rather than the earlier aluminum crank handle. That is what one might expect with cars built late in the 1914 model year. This "barn find" touring has the earlier cast brass quadrant at the top of the steering column where my roadster that was assembled about 2 months later has the later style of stamped steel quadrant at the top of the steering column. This car is in exceptional original condition because it most likely has not been messed with since it was last registered in 1933. Those covers no doubt protected the upholstery through the years but are now in tough shape for the most part as you can see in these photos. The 4 ignition coils look good but they are newer than the brass top or copper top coils that supposedly came in this car from the factory. I have not removed the coils and do not intend to. 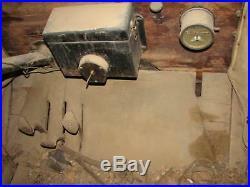 The coil box lid is correct and has quite a layer of 84 year old dust on the top of it. 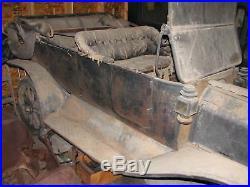 The rubber mat on the front floor is from a later Model T that has the tapered front toe board. There is a significant amount of dust on the folded top assembly indicating that it may have been down for many years. Whoever folded it down did not do it correctly but I decided to leave it just as it I received it a few years ago. 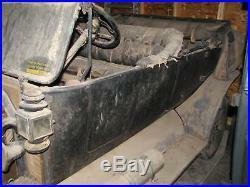 I can find no rusted out sheet metal anywhere in this body or the running boards or fenders. The wood all appears to be good when looking up from the bottom of the car or opening and closing the 3 doors. The paint is flaking off of the body so I have been very careful to not bother it at all. The rear fenders are quite good but the front fenders have some minor damage on the edges as you can see in the photos. The first two photos of this listing were taken the day I picked this car up and the condition of the car has not changed since then. The treads on the tires are hard and were falling off the day I picked this car up some years ago. After I got this car home inside an enclosed trailer, I found a dolly to put under the rear axle and used a floor jack under the front axle to move this jewel out of the trailer and into the warehouse. I did this because I wanted to preserve the 90 year old or so tires the best I could. 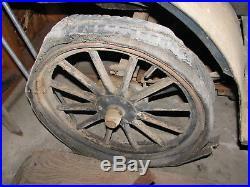 New tires would definitely look way out of place on this "Rip VanWinkle" automobile. The engine still turns over fine but I have not and never will try to make this car run again. The photo of the right side of the engine shows that the right front corner of the cylinder head has been fusion welded with real cast iron rod a very long time ago. I can find no other evidence of any damage anywhere on the cylinder head or the water jackets on the engine block. This damage may have been done from freezing but I have never seen a Model T cylinder head break on that corner unless it was accidentally dropped at some time when grinding valves or removing carbon from the combustion chambers. There is an engine splash pan on the right side of the engine. It has quite a collection of crud in it as well as an oil can that does not appear to have the Ford script on it. There is also an engine splash pan on the left side of the engine and it too has a collection of crud in it. 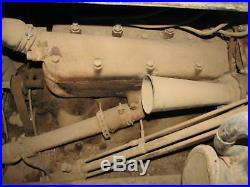 It is rare to find a Model T with either splash pan let alone both of the original engine splash pans still in place. The fact that both of them are in still in place tells me there is a good chance that this engine has never been out of this car. The radiator fan has the small brass pulley as it should have. The radiator looks fine from both the front and back. Something scraped downward on the front of the core and slightly bent the very fronts of some of the finds down. That is why the core looks a bit "cloudy" in some of the photos. This very minor damage would be easy to fix but I think it is part of the history of this "time capsule" so I will leave it just as it is. Someone soldered a 1-1/2" long piece of 3/8" diameter brass tubing to the top of the radiator cap a very long time ago. This was most likely done so they could put a flag or flower in it for a parade. You can see that the three transmission pedals are the correct lettered style and one can see an aluminum transmission cover when looking up from underneath this car. There is a Stewart speedometer head on the right side of the dash but the drive cable and housing assembly are missing. The speedometer face has "Stewart" in script at the top with "Magnetic Type" in small letters underneath. Somewhere around 5 or 6 different speedometers were supposedly offered by Ford dealers in 1914. This speedometer does not exactly match any of those shown in McCalley's book. It does, however, look just like the Stewart Model 100 used in 1913 with slightly different graphics on the face and a much smaller reset knob. The speedometer drive mechanism is present on the right wheel spindle but the speedometer drive gear is missing from the back of the right front wheel for some unknown reason. T he rear axle is the correct 12 rivet style as you can see in the right rear photo. The wheels are the correct non-demountable style with very poor 30 x 3 tires in the front and similar condition 30 x 3-1/2 tires in the back. The wheels look fine and still have some of the original black paint intact on them. The steering wheel is the proper diameter and has the black painted spider and the wood rim that was also painted black from the factory. I would say that about 1/4 of the original black paint is still on the wood rim of the steering wheel. The windshield has the correct style of 1913 to 1914 hinges that let the upper part stand up straight or fold as it should. I have not tried to fold this windshield and will not try to do so. The glass has a crack in the lower right side. Someone that did not know what they were doing wrote "1911 T" in white paint on the right side of the front of the upper glass just before I bought this car. Someone else applied a Thermoid brake decal to the left side of the lower glass a long time ago. I have not cleaned this car at all for fear of reducing the value of it to anyone who might appreciate it like I do. 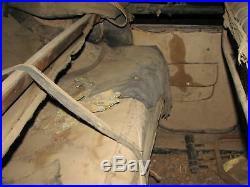 The front and rear floorboards are covered with things such as a hook for the leather strap that holds the front bow of the top to the windshield hinge, a whip socket from a buggy and some miscellaneous pieces of leather. All four of the hubcaps appear to be the later nickel plated versions so a previous owner may have chosen to "modernize" this T long ago. 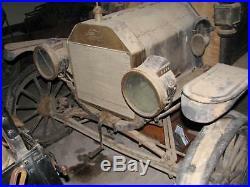 The lamps are all Corcoran except for the right headlamp which is of John Brown manufacture. Perhaps it was replaced a long time ago. I have a lot more. Please do not ask me to. This extremely fragile original and irreplaceable historical artifact would be impossible to replace so it is near and dear to my heart as a student of history. I may be able to safely and economically deliver this great old Ford "survivor" to you depending on where you live and how soon you want it at your place. I can store this car for you if you are planning a trip here to beautiful Montana some time this summer or fall. In conclusion, this is not only a rare opportunity to acquire a very interesting and special vehicle, it has to be a unique opportunity to do so. You will most likely never have a chance to acquire an early brass T in this condition again so please give it some serious consideration over the next few days. 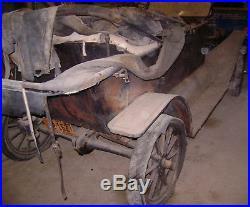 The item "Barn Find 1914 Ford Model T Touring 1908 1909 1910 1911 1912 1913 1915 1916" is in sale since Friday, July 20, 2018.